For a brief time in the summer of 1993 Cathy Gordon and I were roommates. We both left York University’s Theatre program and were ‘interning’ for arts groups in the city. Cathy had landed a job working on a production called Poundemonium by an indie Toronto company called DNA –she later became its General Manager. DNA’s artistic director Hillar Liitoja made a lasting impression on me; he would insist on leaving Cathy messages on our machine rather than dictating a message to me in person. I would surely get it wrong. We had one of those microcassette answering machines, so I could hear the message as Hillar left it – he used complete sentences with appropriate punctuation and would enunciate every vowel clearly when leaving his message. Does anyone speak in complete sentences anymore? Later that year, in October to be exact – because I know Hillar would want me to be exact – I had my second DNA experience. I was an audience member at a show called The Last Supper, which played at Theatre Passe Muraille Backspace. It featured Ken McDougall, Sky Gilbert, Jim Allodi, Marti Arkko and Cathy Gordon, and if you don’t know it – you should! To this day, it is one of the most moving, thrilling and essential theatrical works I have seen in my life. Hillar went on to win a Dora Mavor Moore Award for best direction, his third in that category. The Theatre Centre has had a very long history with DNA. We have presented, premiered and hosted many DNA performances, including most recently Wit in Love at the 2010 Free Fall Festival. Red Light, Green Light is DNA’s latest work choreographed by Hillar and Magdalena Vasko, and it has taken at least four years to get to the stage. In the past, you could expect to see at least one DNA show a year. Why has it been so long since DNA premiered such a large-scale work? 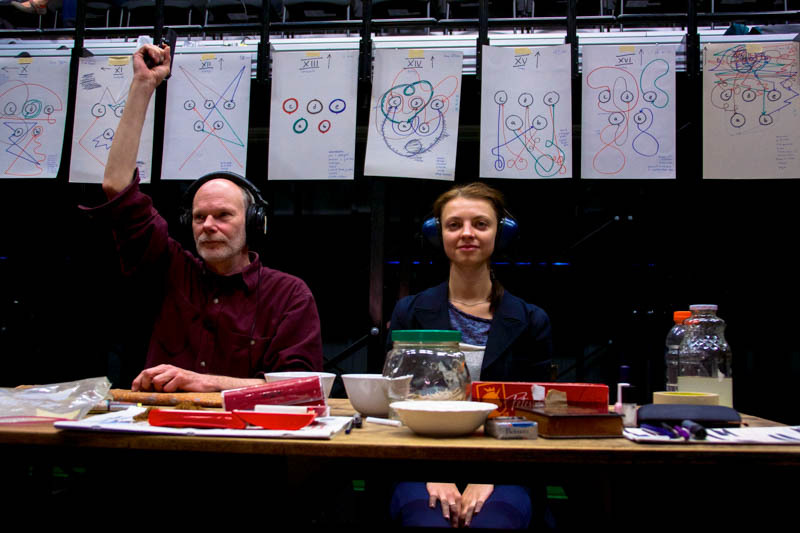 Can our current theatre ecology sustain a company like DNA Theare? Who are companies like DNA making work in our theatre ecology today? How does an artist like Hillar make work in a system that primarily values money and consumption? Red Light, Green Light previews tomorrow night and opens Sunday at The Theatre Centre. Hillar doesn’t expect you to be there, but let’s surprise him and welcome him back with full houses! Limited Seating. Click here for more information on DNA and here for tickets to the show. Manager of Artist & Community Activation – deadline to apply is August 19, 2014.